Situated on the banks of the Chambal River, the industrialized city of Kota is a good option for those who are looking for a short trip to Rajasthan. The historic Kota fort is an impressive structure that overlooks the Chambal Valley project, with its’ many dams. Kota is also well-known for an artificial lake constructed by Prince Der Deh of Bundi and the Jag Mandir, a magnificent structure that emerges from the lake. 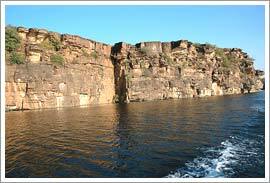 Boat rides to the sandstone monument add to the tourist experience. The Umaid Bhawan Palace has a history of its own. It came into being after Maharaja Umed Singh decided that he wanted a palace for personal use. It was home to the royal family of Kota but now stands as the Welcome Heritage Hotel. Around 50 kms from Kota is the Darrah Wildlfe Sanctuary, the seat of wildlife variety such as spotted dear and the panther. The Dusshera Mela is an interesting feature of social life in Kota, during the months of September-October. The Brij Vilas Palace Museum near the Kishor Sagar Lake presents an interesting collection of weapons that were used in warfare, besides statues and paintings. The Maharao Madro Singh Museum that is part of the city palace is an interesting place to visit, especially for history buffs. Shopping interests in Kota include the famous Kota Doria saris, a tradition that has its roots in the Kethun village. Kota is easily accessible from Dehi and surrounding Rajasthan by train and road. The climatic conditions in Kota average around 42°C in the summers and 25°C in the winters. So make sure that timing is right, a thumb rule for any travel plan.